Getting to the computer is an increasing challenge. Sometimes, I have the opportunity to do so after everyone is asleep. But then I want to go to sleep too. Sorry blogworld, you’re second best these days. Getting a bit of shut-eye precedes all else. The importance of sleeping was crystal clear yesterday. If you looked me in the eye you would have seen how blood shot those hazel acorns were. After a week of waking every one or two hours, and then the last two nights being awake for over three hours in the middle of the night/early morning, my eyes had certainly lost their shine. (The triplets have been sick.) By the end of the day they were a festering mess, it stung to keep them open and felt like sand was in them every time I blinked. Needless to say as soon as the triplets were fed, (thankfully it was early last night), I was asleep myself. And oh, what joy, what bliss, I got a three hour stint before I had to wake up and start feeding. Uninterrupted sleep is hard to come by at the moment. And I tell you, to not be woken for three hours felt like I had been asleep FOREVER. Truly. I felt like sleeping beauty. I got such a shock when I looked at the alarm clock and saw it was 11pm. I had thought it was almost sunrise! Then I got another three hours! Oh happy heart indeed! I also have a bit of competition getting to the keyboard. The other morning I was up early, so thought I might get some blogging time before the house awoke. I shouldn’t have gone to the toilet first. Reading Eggs is a big hit in our house at the moment. Who am I to compete with an educational game? Especially when J Boy has such an eager little fan tracking his progress. Then there are other times I do get to the computer. But normally there is a baby in one arm. I’m an expert at one finger clicking. I may be reading your blog. Hello! As much as I like to leave comments, I find one finger typing a trifle tedious. So I might be just stalking you at the moment. I’m not good at one fingerness. But I do it when I have to. And then I make lots of silly spelling mistakes. It’s embarrasing to do this when you are a teacher. Suppose I’m the triplet’s Mummy these days more than I’m a teacher. I’m OK with that. So one finger blog reports. Not happening. I’ve also been writing for Bella magazine. It’s such a pleasure to have the opportunity to present 13-19 year old girls with a wholesome way of thinking. I’m writing an article on my sister Katrina at the moment. You know I’m a big fan of hers! Since it’s the Australian Year of the Farmer, it’s a great chance to give the girls a chance to read about a successful female farmer, and maybe be inspired to work hard themselves as well. You have to get anywhere in this life. That’s a fact. And then there’s boring reasons, like I’m back at work. Not very much work, but enough to inhibit frivilous writing like blogs. I work for a university. I’m a liaison when student teachers do their pracs. It’s pretty cool, and for this time of life, nice and flexible. I’m dealing with external students at the moment. I probably spend an hour or two each day sending and receiving emails. It’s a juggle, but it’s nice to do something that you don’t get spewed on for your efforts. Oh, and you get paid. A bit of pocket money doesn’t hurt. We’ve run out of our baby shower nappy and wipes supply. Ouch. The shopping bill has increased dramatically. I’m so grateful to all those who helped us through the first few months. It was awesome. But now the reality of taking care of three bums is setting in. Four bums actually. T-star has started potty training, but we’re still needing to buy him nappies. He’s doing OK. There was just one occassion that I had to clean a large amount of poo from the carpet/lounge/toys etc. Probably a bit more inspired to make him wear training pants after that. He prefers to run around nudie. Because he had been better at going to the toilet when he wasn’t ‘inhibited’, I’d been letting him. Maybe wasn’t such a good thing in hindsight. T Star found the event disturbing as well. He thought he could poop sausages. Truly. He thought he’d hit the jackpot and could self produce his favourite meal. It was terribly disappointing to find the sausages squished in his hands. 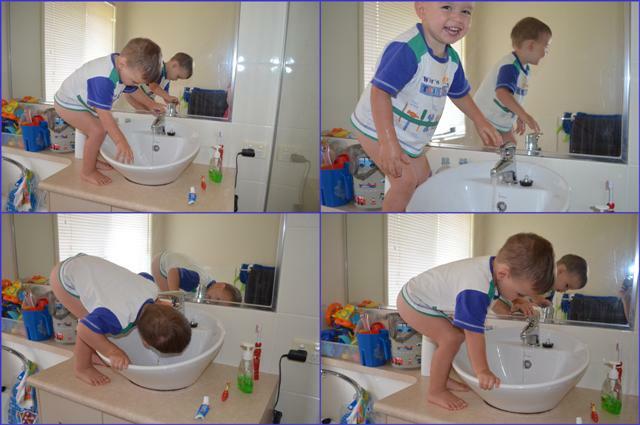 We all know washing your hands (and maybe having a little drink at the same time) is just as fun as going to the potty! So there you have it. All my excuses. Is it sufficent reasons to excuse me for my unreliability? Do you have any hurdles getting to your computer at certain times? Anyone else battling with any of the same issues as me? Hello also to those dropping by from Kelly’s Korner who I’ve linked up with.